Exception handling appears in most .NET applications, this post is trying to describe some Exception handling particulars in C# which might not take enough awareness from C# developers. The answer is yes! To prove that I wrote a simple snippet of code below, first is a simple customized Exception: DummyException. So the difference is, "throw ex" will truncate the StackTrace information where it was originally thrown (this will cause the so called issue - "breaking the stack"), but "throw" will contain all the information. rethrow: Rethrows the current exception. throw: Throws the exception Object currently on evaluation stack. When initializes AnotherTypeOfException we actually calls Exception's construcor "(String message, Exception innerException)", so finally there will be no information loss. 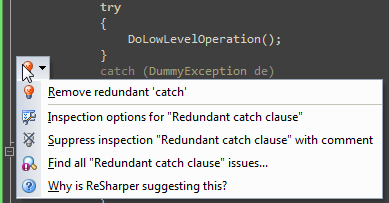 There is one particular details, when we wrote code similar with below, Resharper will warning us it is redundant, because "The catch statement may appear to be doing something, but it really isn't: all it's doing is throwing the exception (with the same stack information)", Resharper link. Instead, if we wrote "throw de", in the above example, Resharper will NOT give you any warning, because now we know they are different, "throw de" will truncate the StackTrace information and rethrow the DemmyException instance. Before .NET Framework 2.0, Non-CLS-Compliant exceptions does not inherit from System.Exception, that means catch (Exception ex) cannot catch Non-CLS-Compliant exceptions thrown from for example COM or native C++ components; However, in .NET Framework 2.0, compiler will wrap those Non-CLS-Compliant exceptions into an specific Exception type: RuntimeWrappedException, it has a property: WrappedException to store a non-CLS-Compliant exception, results in statement "catch (Exception ex)" can catch all runtime exceptions. Whereas this is configurable, the wrapping operation is by default on how ever could be turn off be applying RuntimeCompatibility attribute to your assembly, i.e. AssemblyInfo.cs. By specifying WrapNonExceptionThrows = false under RuntimeCompatibility attribute, Non-CLS-Compliant exceptions will not be converted to System.Exception, so they will not be caught by catch (Exception ex) but can be caught by parameterless catch. I find u form codeproject when I search something about how to use google latitude on a WinCE device with somekind of GPRS modem. Ur blog with full english shocked me a lot, u give me a example that we can study the details deeply. Tks ur contribution and the free code!